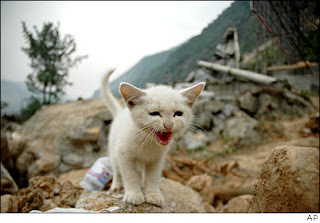 Lonely kitten in earthquake rubble in China. China has a terrible record for human rights and pollution - among other things. They're doing their best to clean things up before the Olympics, including fostering ideas about cats as carriers of human disease and killing hundreds of thousands of cats. This has gotten so out of hand that even school teachers on playgrounds feel compelled to beat stray cats to death with sticks to keep their charges safe. On a slightly lighter note - they are also trying to ban any horror films that feature "wronged spirits and violent ghosts, monsters, demons, and other inhuman portrayals, strange and supernatural storytelling for the sole purpose of seeking terror and horror." Americans are showing a stronger aversion to the "Made in China" label. While it's clearly more green to buy local -- it's quite difficult to avoid products made in China is widely documented. When I lost my stainless steel insulated mug, I found that they all seem to be made in China. I settled for a second-hand mug that was abandoned in the kitchen at my office last fall after a round of layoffs. I definitely spend more on shoes to get vegetarian shoes (from VeganEssentials.com and MooShoes.com) which are made in England and other places that are Not China. How do you do it? What have you given up or substituted?